A bronze statue of comedy legend Stan Laurel is being unveiled in the County Durham town where he went to school. Cumbrian-born Stan Laurel was baptised and lived in Bishop Auckland during the early part of his life when his parents ran the local theatre. 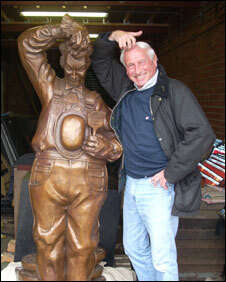 Wear Valley Council commissioned South Shields artist Bob Olley to design the £37,000 statue as part of the town's Theatre Corner improvements. The 5ft 9in (1.8m), 400kg statue was cast in the Sichuan province of China. Laurel was born in Ulverston, Cumbria, but moved as a baby to Bishop Auckland, where he was baptised at St Peter's Church and schooled at King James Grammar. He moved to the USA in 1910, where he achieved worldwide movie success with his comedy partner Oliver Hardy. Barbara Laurie, chair of the Bishop Auckland Town Centre Forum, said Saturday's unveiling was a "fitting tribute" to one of the town's most famous residents. She said: "I'm sure the statue will not only delight our regular town centre users, but will also be an attraction to Laurel and Hardy fans throughout the country and perhaps even further a field."